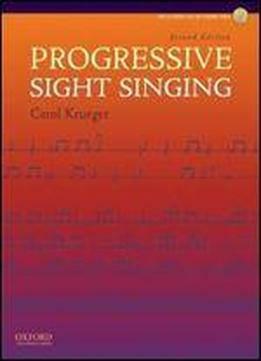 A comprehensive, student-centered, and flexible introduction to sight singing, Progressive Sight Singing, Second Edition, by Carol Krueger, presents students with the underlying grammar and syntax of musical structure and prepares them to perceive that structure with both the ear and the eye. Working from the premise that students learn musical skills in much the same order as they do language skills, the book trains the ear firstthrough hearing and imitating patternsbefore teaching students to read and write. Divided into two parts, the text presents rhythmic exercises in Part I and melodic exercises in Part II. The two sections can be used concurrently over a four-semester course sequence, giving instructors the flexibility to teach at a pace that suits the abilities and backgrounds of a particular class or course schedule.